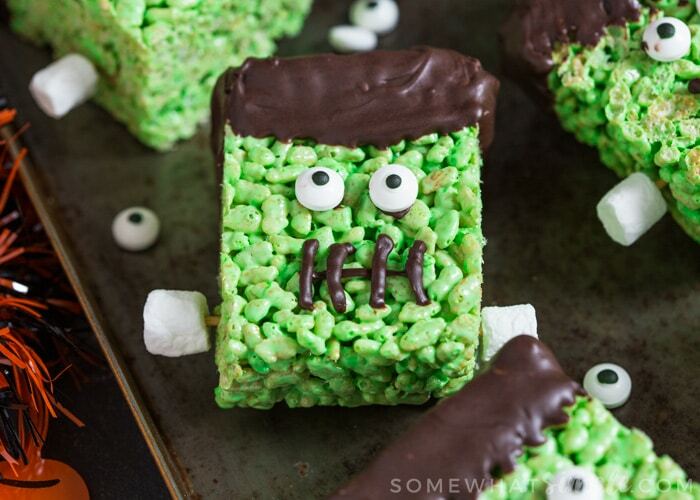 Frankenstein Rice Krispie Treats make a fun, kid friendly snack that is perfect for Halloween! The shops near me this year seem to have forgotten about Halloween and they’ve gone right to Christmas. 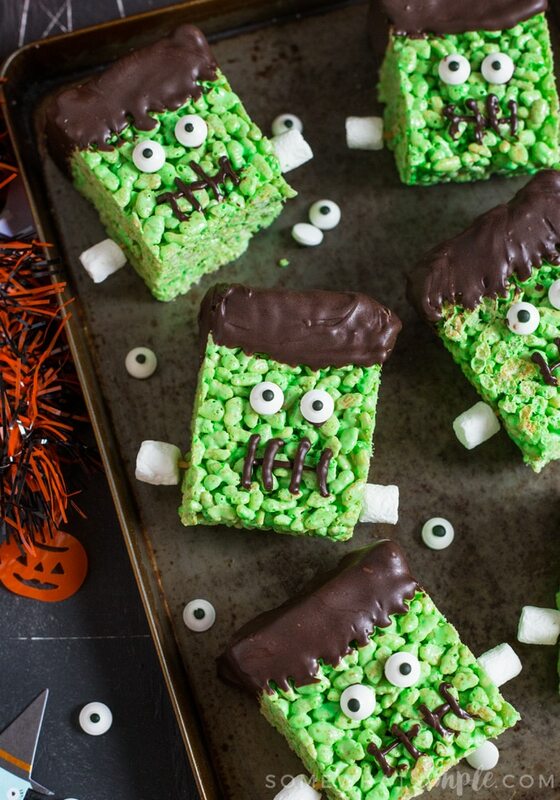 I’m definitely not ready for that, so today I’m coming at you with these darling Frankenstein Rice Krispie Treats. 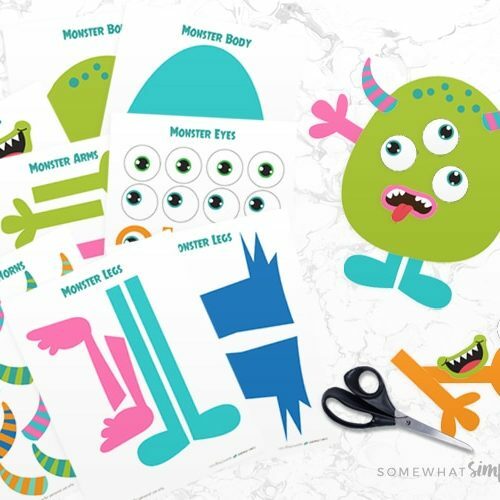 Kids will love decorating these fun treats, AND they don’t take long to set either, so they’ll be ready to devour in under an hour! 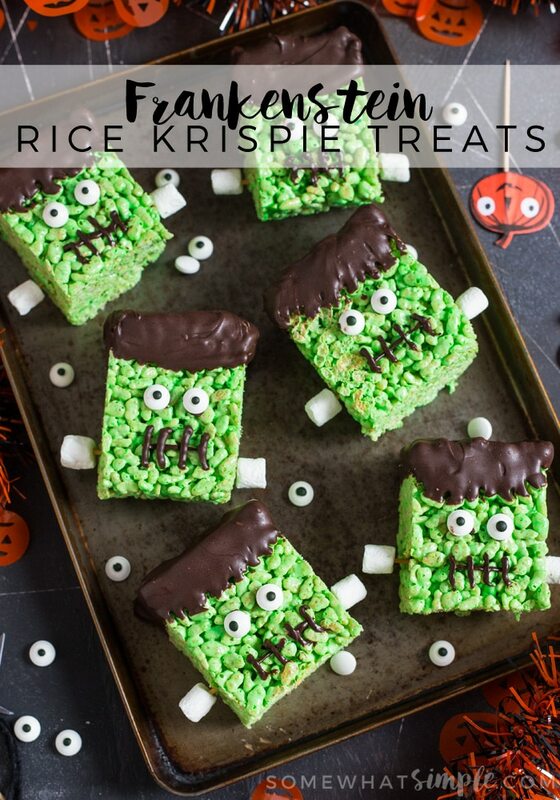 These Frankenstein Rice Krispie treats are perfect for a Halloween party, but simple enough to make for a quick afternoon snack. Best of all? They taste as good as they look! This time I decided to use Marshmallow Fluff instead of melting down marshmallows and it resulted in the best, most chewy rice krispie treats I’ve ever had the pleasure of eating! *Note for the hair/mouth: If you can get your hands on black Wilton candy coating then use that. It is ALWAYS out of stock whenever I look, so I used the Wilton candy coating in Dark Cocoa and it worked just as well! Grease and line an 8x8 inch square pan with a double layer of cling wrap. Place marshmallow fluff and butter into a large saucepan over a low heat. Stir continuously until all the butter is melted and the mixture is smooth and well combined. Add in the green food coloring a few drops at a time. Stir until you’re happy with the color. Mix in the rice krispies, adding 1 cup at a time, until they are all coated in the green marshmallow mixture. Tip the mixture into your prepared pan and press into an even layer with a spatula. Leave to set for 30 minutes in the fridge. Once chilled, transfer the krispie treats from the pan to a cutting board and cut into 2.5 x 2 inch rectangles. Place a wire rack over kitchen paper and get ready to decorate! Place the candy coating into a medium sized shallow bowl and place in the microwave in 30 second increments, stirring in between until all the coating is melted. Take ¼ of the mixture and place in a small Ziploc bag. Leave to one side. Dip the top of each cut krispie treat into the bowl of melted candy coating. You want it to come ¼ - ½ inch of the way down the krispie treat; this is his hair line. Repeat with all of your krispie treats and then place them on the wire rack to set. 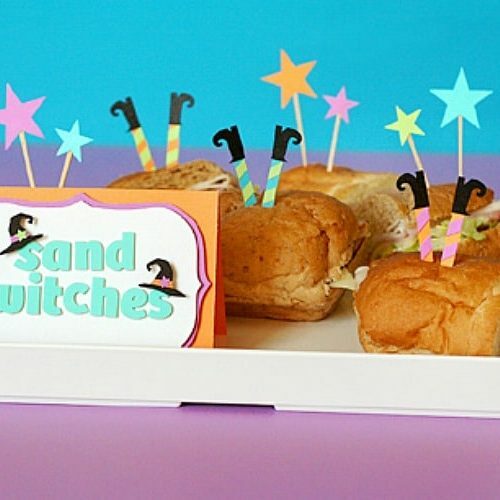 Use one of the toothpicks to place a little of the extra candy coating onto the back of your candy eyes and stick them to the front of your krispie treats, about ½ inch from the “hair”. Snip a tiny hole into the end of your Ziploc bag and pipe a line ½ inch away from the candy eyes across the krispie treat. Then pipe a line perpendicular to the line across the treat at either end. Pipe two more along the line to create his mouth. You can also pipe a zig zag line for his mouth, whichever you prefer. Poke the remaining toothpicks through the side of each krispie treat in line with the mouth. Place a mini marshmallow on each end of the toothpick. Repeat until all of your krispie treats are decorated, then leave to set for 20-25 minutes. 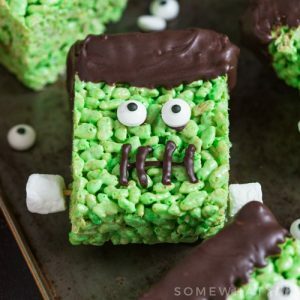 Frankenstein Rice Krispie Treats will keep in an airtight container, at room temperature for 3 days, or in the fridge for 5 days. 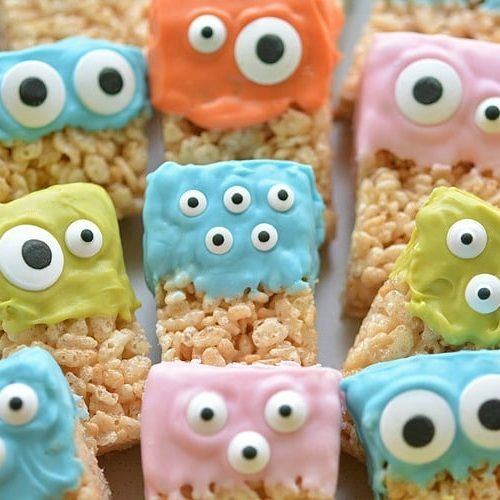 I hope you enjoy the mess and fun of making these darling rice krispie treats! 10 Rice Krispie Treats We LOVE! Hi! 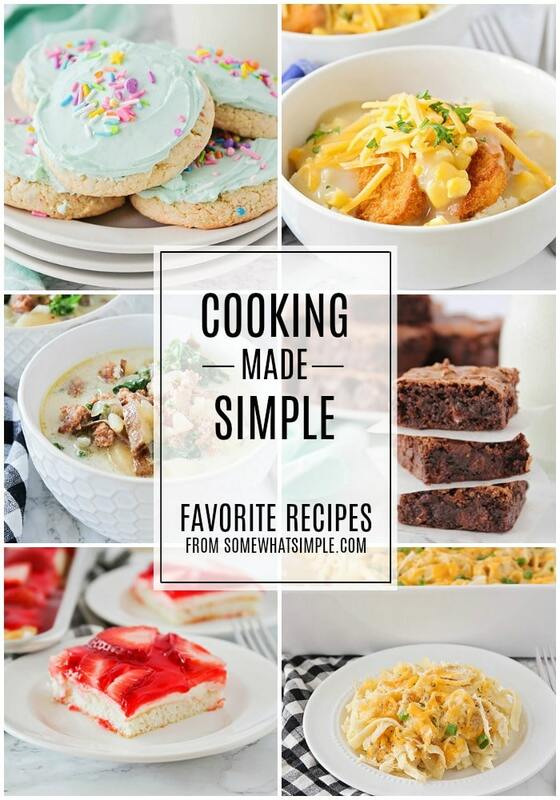 I’m Stephanie – welcome to Somewhat Simple! We hope to inspire moms from all walks of life simplify their everyday routines and create happiness along the way. Subscribe to my free e-course and receive 5 time-saving tips for crazy busy moms! We are basically best friends now.